IT HAS A SIGNATURE SOUND. YOURS. FROM THE BEGINNING IT'S BEEN ABOUT IMPROVING THE BREED. ABOUT GIVING YOU A PLATEAU TO STEP UP TO. ABOUT FINDING YOUR VOICE. PICK ONE UP. SEE HOW YOU REALLY SOUND. RECOMMENDED FOR LIVING ROOMS, PRACTICE SPACES, AND CROWDS UP TO 100,000. AT HOME, IN STUDIO, AND ON THE ROAD, DELIVERING EACH NOTE WITH A GENEROUS HELPING OF CLARITY AND PRECISENESS. IT'S THE BASS OF INFINITE SOUNDS. YOUR SOUNDS. PICK ONE UP. DIAL IN YOUR SIGNATURE SOUND. WHY SOME SONGS LAST 3 MINUTES AND OTHERS FOREVER. WHAT TURNS ONE INTO GOLD AND THE REST INTO OBSCURITY? WE BELIEVE IT HAS SOMETHING TO DO WITH CAPTURING THE TRUTH. THIS BASS WAS BUILT FOR YOUR PUREST SOUND. PICK ONE UP. DIAL IN YOUR SIGNATURE SOUND. GO FORTH AND MAKE HISTORY. At Modulus Graphite, our journey has led us to building bass guitars. Our approach fuses passion and tradition with a wellspring of new thinking. The result: Unrivaled playability. Sweet, consistent tone. Your signature sound reaching its fullest potential. The Quantum TBX, our flagship neck-thru model represents the pinnacle of bass craft at Modulus. When we looked at the rich history of these basses, and tweaked the formula for re-release in 2010, we had one singular goal: No Compromises. When you choose this bass, you are choosing the best of the best. With an aerospace-grade carbon fiber neck, Quantum basses have tremendous presence in the mix. Pristine highs, growling mids, and lows that rattle your innards are included as a standard offering in every Modulus Quantum built. This bass delivers an even response on every string up and down the entire fingerboard with a solid fundamental pitch focus. You want unwavering neck stability with unmatched dynamic range? It's in there. 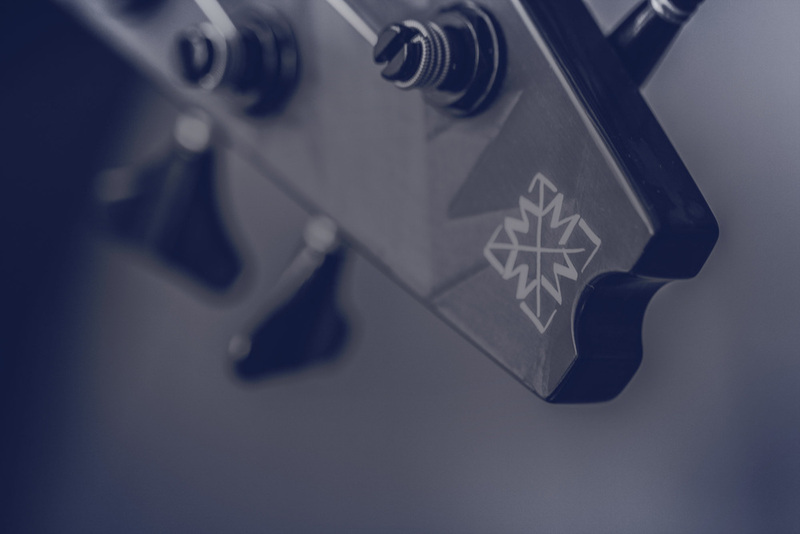 Your Modulus instrument will deliver this unmatched level of stability and performance for decades to come. The distinctively spacey exterior layer of carbon fiber on the Quantum neck, known around the shop as KLD, or ”a thousand (k) ladies dancing“, has been an artistic Modulus trademark for over 25 years. Modulus craftsmanship is another industry benchmark. The fit and finish of every component is as near perfect as possible. We carefully test and match every electronics option to the instrument, so you can feel confident that whichever you choose, it will give you exceptional tone and trouble-free performance. The Funk Unlimited by Modulus. Funk Unlimited Basses feature a uniquely-shaped double-cutaway alder body. The 22-fret, 34” scale bolt-on, carbon fiber neck has a compound radius composite fingerboard, pearl dot top position markers, bi-directional relief adjusting rod and chrome hardware. A single Basslines MM pickup is controlled by a Bartolini active tone system with master volume and 2-band (bass & treble) controls. Funk Unlimited Basses are also available with J, P/J or MM/J pickup configurations. The Vintage J is closest to the original Modulus concept — an aerospace-grade carbon fiber neck mated to a traditional body with upgraded electronics and hardware. Choose the Vintage J for synth-like sustain and wide response. The VJ4 features a top-routed alder body and a 21-fret, 34” scale neck with pearl dot position markers. Two Bartolini J-style pickups have separate volume controls and a passive tone controls. The Funk Persuasion by Modulus. Funk Persuasion Basses features a top routed Funk Unlimited body with our P inspired pickguard. The 22-fret, 34” scale bolt-on, carbon fiber neck has a compound radius composite fingerboard, pearl dot top position markers, bi-directional relief adjusting rod and chrome hardware. One Bartolini P pickup is coupled to our proprietary tone circuit with passive volume and tone controls. There's Modulus gear for everyone.